Like any Government Institution, NABCO does not like to pay people who have not done any work. Unfortunately, the last time November and December Stipends were paid, a lot of people not currently working received the Stipend. Also, some people who were not placed at all received stipend and the last group of people who were placed but they have not been going to work with NABCO also received stipends. In all of this, there are some people who are genuinely working and yet have not received any stipends yet. So instead of NABCO to pay January Stipend, they seem to have instituted a new measure to make sure only the right people are paid. They call this the Assumption of Duty Form. What is the NABCO Assumption of Duty Form? 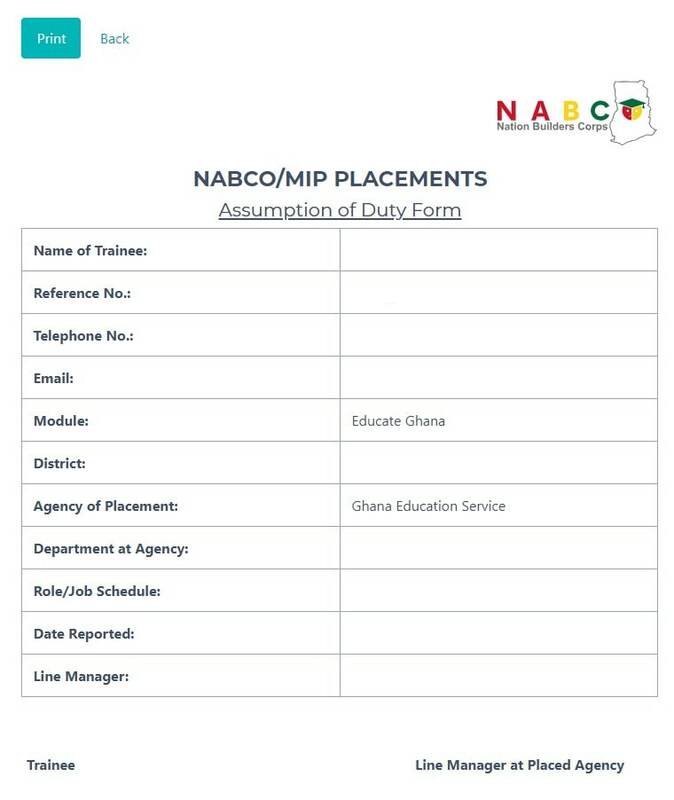 The NABCO Assumption of Duty Form is a document available to only placed and accepted NABCO trainees to confirm they have started working with NABCO. The form has to be completed by the NABCO Trainee and signed by the Trainee, Line Manager at Placed Agency, District RTC/Monitor and the District Coordinator. To get the NABCO Assumption Form, you need to log in to the NABCO Portal and visit the assumption letter page. Then you will be able to print the letter. If you don’t have a printer, you can save it as a PDF and print at an internet cafe. You can also print it at your place of work if it is acceptable. Once you are done, your line manager will have to sign and you have to sign too with both of you indicating the date you filled the form. After this has been completed, you need to take the Assumption Form to your NABCO District Office where it will be inspected and signed by the NABCO District RTC/Monitor and District Coordinator. When all have signed and the form is all completed, you will have to scan the form in PDF. Then log in to the NABCO Portal and click on “Upload Signed Assumption of Duty Form”. You will be presented with a new page to upload the form (PDF). After uploading, you will have to enter the name of the Line Manager (Make sure it matches the one on the form) and the Department you work at. You will receive a success message when it is done. The assumption of duty form is important because it is what will determine if NABCO Trainees will be paid. All those who have not been placed yet will have to wait for placement to continue receiving their stipends.